Best of Care, Close to Home. A Union of Compassion + Healthcare. Because Your Life Matters. Addiction is a difficult disease to face. Intrinsic to its insidious nature is a tendency to suppress symptoms and hide your problem. Unfortunately, by hiding substance abuse, it only makes it more difficult to receive treatment. A ddiction is nothing to be ashamed about. Regardless of a person’s personality, history, or current position in life, addiction can affect anyone. If you or someone you care about is struggling with addiction, you should know that the best chance at recovery will come from a substance abuse treatment center -- and at the Relapse Prevention Recovery Center, we specialize in getting you the care you need. 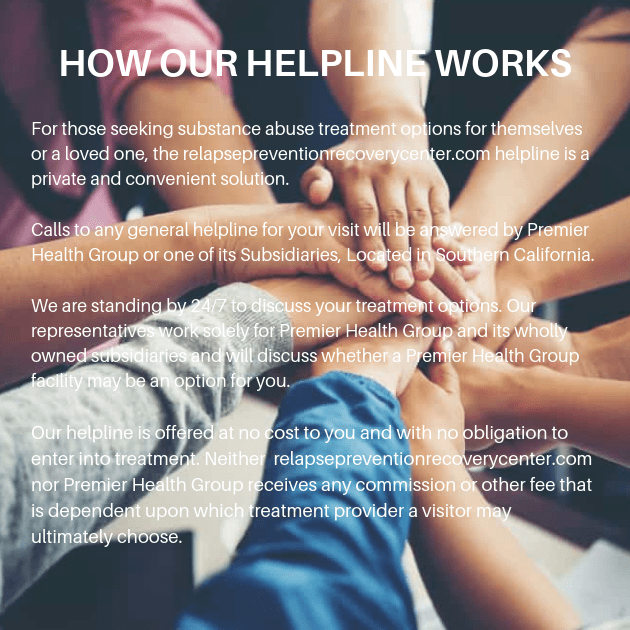 At Relapse Prevention Recovery Center, we provide a safe and comfortable environment in which to examine your personal situation and receive treatment for dependency on illicit substances. We always begin by conducting an intake interview with our clients. During this process, you’ll be asked questions about your personal history, your family history, and your addiction. It is of the utmost importance that you provide honest answers during this interview, since the information gathered will be used to create a customized addiction recovery treatment plan. 2Why a personalized addiction treatment plan? Some addiction recovery programs are content to give each and every client who walks through their door a copy of the same one-size-fits-all recovery plan. Unfortunately, this doesn’t take into account the fact that each addiction, just like each individual, is entirely unique. In order to provide the best possible treatment -- the treatment that will afford each client the best possible chance at recovery -- we personalize your treatment plan to better suit your individual needs. 3What is Dual Diagnosis Treatment? Roughly half of clients are not only dealing with an addiction, they are also attempting to cope with a co-occurring mental health disorder. These co-occurring disorders can take a number of forms, but in essence, they make it nearly impossible for clients to overcome their addiction and successfully reach recovery. Through dual diagnosis mental health treatment, we are able to treat both the addiction and the mental health disorder simultaneously, thus giving our clients an exponentially greater chance at reaching recovery. We screen for any underlying mental issue that might be affecting your recovery. We surround you around like-minded individuals who have the same common goal. Our support doesn't end once you leave our care. You become part of our community the supports one another. First, we screen to see if you’re an ideal candidate for our program. We will find out if any mental illnesses are contributing to your addiction. We build a customized therapy program for you and also begin to participate in group therapy. After the program is completed you become part of our growing community that supports one another in the path to recovery.